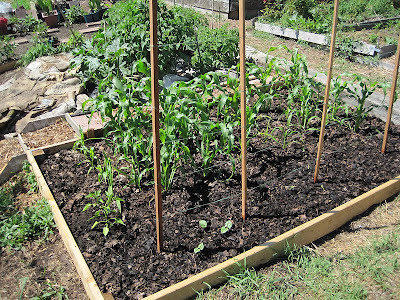 Well, with the steady warmer temperatures the p-patch plots are doing quite well. The corn is especially coming along. As you can see in the above pic the extra 70sf I cleared has been bordered and I added most of the compost I just completed. Besides the corn, I planted beans and erected a trellis, and am placing some bell pepper plants on the south side to give them an unobstructed view of the sun. Many of the bean seeds did not come up, and some are being attacked by slugs or cut worms. 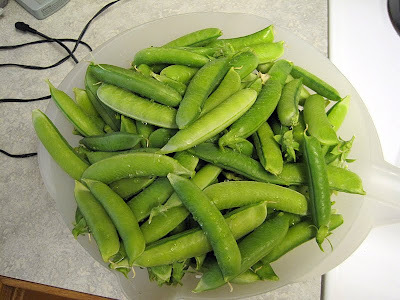 Furthermore, I have been picking peas steadily for the past two weeks. This year has been a bumper crop. The rodent population is way down (I think someone has been killing them) and I've had little to no damage to the peas this year. Most years I lose roughly the first third of my pea crop to rats before the growth outraces their appetite and my ability to pick the ripe peas. Also, the cooler temperatures this year has allowed the plants to continue along, whereas in the past the 80+ degree temperatures would have them fully matured and decaying by now. Finally, my Cyclamen intaminatum has produced a single white flower. 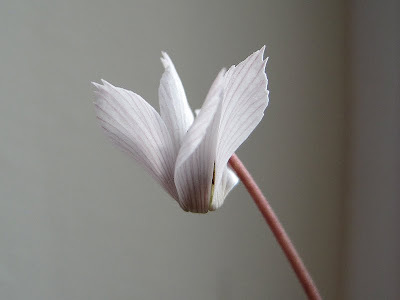 Out of all the cyclamen species inteminatum produces the most petite blooms.